I'm pleased to say the protracted effort to sell the Hoboken Municipal Garage is finally moving forward, with many benefits ahead for the city and its residents. As the second ward representative on the council you have entrusted me with your hard earned tax dollars. I take this responsibility very seriously and say clearly that the offer accepted by the council last week is by all measure the best deal for the City of Hoboken. My council colleagues and I accepted a bid that balanced the wants of the neighborhood with the needs of the city. If all goes as planned, Hoboken residents will soon become accustomed to a new, 8- to 12-story residential complex stretching from Newark Street to Observer Highway as a result of the council’s decision to approve the sale of the Municipal Public Works Garage during Thursday evening’s special session. After five years of discussions and setbacks, the City Council finally approved a resolution Thursday night to accept a $25.5 million bid for the city's 1.1-acre Observer Highway Public Works Garage. In return, a developer will be allowed to build a 240-unit residential structure that will rise to eight stories along Newark Street and 12 stories along Observer Highway. The Hoboken City Council voted down an ordinance Wednesday night that would have raised the allowable height for development at the city's municipal garage property on Observer Highway from nine to 12 stories. But Mayor David Roberts said that raising the maximum would allow the city to sell the land for more money and use that money to buy park space elsewhere. HOBOKEN - Officials at the state Department of Community Affairs pressed city officials about a $5 million revenue source for its 2006 budget after reading a story in Friday's edition of The Jersey Journal. On Wednesday, the City' Council approved an ordinance nance to allow a paper corporation, NWF Leasing Corp, to take over a sale/leaseback agreement from the Hudson County Improvement Authority by borrowing $15 million from North Fork Bank, allowing the city to plug a $5 million budget shortfall. The arrangement stands to cost the city an additional $600,000 to $700,000 a year in added interest and administrative costs. In the mad dash to plug a $5 million budget gap by June 30, a divided Hoboken City Council was left in a precarious position Wednesday night. On the table were two bids from development groups that want to buy the city's municipal garage on Observer Highway and build high-end condos. The council's lawyers deemed both of the bids - for $22.1 million and $18 million respectively - deficient. Yet, there were those on the council that wanted to approve the high bid as a way to instantly shore up the city's budget and reap a cash windfall. The Hoboken Planning Board voted Monday to label the city's Municipal Garage on Observer Highway an "area in need of redevelopment." If the City Council accepts this recommendation at a special meeting Monday at 6 p.m., the council can choose a developer to build on the site and then sell the property to that developer for a needed cash infusion. The city is already anticipating $5 million in this year's proposed $72 million municipal budget from the sale. A similar situation occurred last year, but a council minority balked at the deal, forcing the budget to be held up longer and city government to temporarily shut down. The minority did not want to be rushed into the deal. For the current fiscal year, a proposed city budget was introduced in December but has still not been finalized, even though the year began last July 1 and ends in three months. hearing on the 2005-2006 fiscal year budget. year that, while $5 million less than the year before, does include a possible 2 percent tax increase. The budget can be amended with council suggestions (see sidebar) and will have a public hearing before the final vote, probably in October. 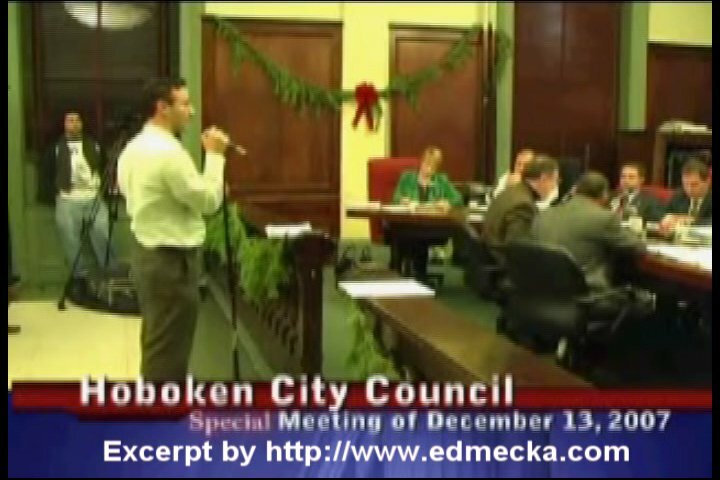 he Hoboken City Council has a budget. In many communities, that would be the end of the story, but not in Hoboken's turbulent political waters. Budget talk will likely continue at least until the May 10 mayoral and City Council election. On Monday, the council approved its $72 million 2004-2005 fiscal year budget by a vote of 5-4. Mayor David Roberts praised the budget Tuesday and said he looks forward to moving forward with the business of the city. To be fully funded, Roberts' budget relied on a plan to sell the city's municipal garage to the Hudson County Improvement Authority, a quasi-autonomous public agency, for at least $7.9 million. The HCIA would then lease it back to the city. Thus, the HCIA would be lending the city at least $7.9 million. ity services were re-opened at the end of last week after a stalemate over the city's $72 million budget had forced non-essential services to shut down for two days. Since the City Council has not yet approved Mayor David Roberts' permanent city budget, which was proposed back in September, they have been passing temporary budgets each month to keep the city running. On Monday, four council members who have been opposing the mayor's spending policies (including two who are running against him for mayor May 10) voted against the latest temporary budget. Garage sale fails. City must find $7.9 million or look to taxes, layoffs. At a raucous City Council meeting Wednesday, the council was unable to pass Mayor David Roberts' proposal to sell the municipal garage to the Hudson County Improvement Authority, a quasigovernmental agency. The intent was to use $7.9 million from the sale to plug a budget deficit. Wednesday's vote required six of the nine council members, but only five of them voted in the affirmative. Thus, the council must find $7.9 million in new revenues for the 2004-2005 budget. Options include making drastic cuts to the municipal workforce or raising the municipal portion of the tax levy by over one-third, all of which could be burdensome considering there are only about four months left in the fiscal year.